23.0 cm (L) x 23.0 cm (W) x 13.5 cm (H) , capacity – 3.3 ltr. 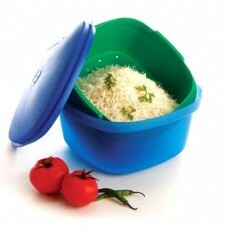 Consists of 5 components: container, cover, Strainer, Idli Trays and Spoon. A multi function product that allows you to cook, steam, strain, reheat and serve. The Strainer fits in the container and has handles on both the sides for easy lifting. Has a self-venting cover, the dome shape of this cover makes the steam/liquid coming from the food/vegetables stay on the cover and will not drip down into the food. Footed base allows for even heating in the microwave by allowing maximum air circulation around the container.